1X/2X - $49.99 3X/4X - $49.99 Only 8 left! Any good magic maker knows that there's more to becoming a powerful witch than potions, black cats, and broomsticks! There is actually quite a lot to learn—like how eye of newt reacts to direct sunlight, the correct pronunciation of hundreds of incantations (and their specific uses), and how to do your witch taxes (the MRS—Magical Revenue Service—makes it just as tricky for witches as it is for the rest of us). So, how does a witch get such training? Why, at a wizarding school, of course! Duh! And an unwritten rule of being a stellar spellcaster is having the right look, right from day one. So grab this Women's Plus Size Spell Casting School Girl Costume and prepare to dive deep into your special studies. We need more witches in the world with good heads on their shoulders, so make sure to dress the part and study hard. Don't let us down! This is a spin on a traditional schoolgirl costume, with a few magical elements! The dress is styled as a shirt and skirt, for easy wear, and features a sleeveless top with a crest patch and a pocket. 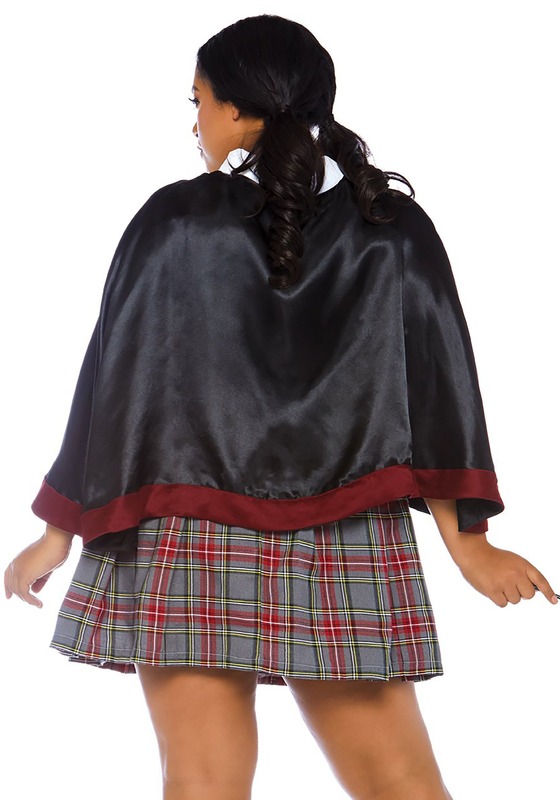 The skirt is a short plaid number in green and red, with a gold and maroon waistband. The cute little necktie helps to secure the short, black cape and keep the dungeon chill off your shoulders. 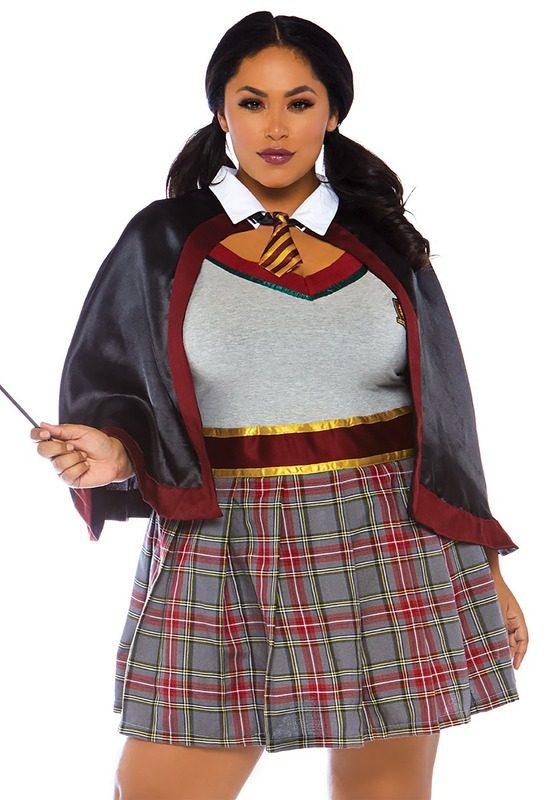 Add knee-high socks, a wand (obviously), and some pigtails to help keep your hair out of your potions! You look amazing! We would definitely place you at the head of your class. We're actually pretty jealous of your big adventure, but it's bound to be a lot of work, too. Maybe just teach us a few key spells and save us all those long nights studying curses and cauldrons! Loved this costume! True to size and very comfortable.